The major goal of my research is to understand how the signal transduction networks that regulate the innate immune system are activated during infection by bacteria and viruses, and to discover how they trigger the production of inflammatory mediators to combat these pathogens. Understanding these signalling networks is important, not just because it may lead to the development of improved drugs to fight infection, but also because failure to control the production of inflammatory mediators causes major global diseases, such as arthritis, asthma, colitis, fibrosis, lupus, psoriasis and sepsis. A further aim of my research is therefore to identify which components of these signalling networks are the most attractive drug targets for the treatment of these diseases. Another focus is to understand the interplay between protein phosphorylation and protein ubiquitylation in regulating the innate immune system, which we tackle by using a range of state-of-the-art techniques that include molecular, cellular and chemical biology, protein chemistry, mass spectrometry and mouse genetics. We have been dissecting the MyD88-dependent signalling network (Fig 1), which is activated by the interaction of bacterial or viral products with Toll-Like receptors (TLR) and inflammatory cytokines of the Interleukin-1 (IL-1) family with their receptors. We recently made the surprising finding that hybrid ubiquitin chains, comprising both Lys63-linked and Met1-linked (or linear) ubiquitin linkages, are formed when the MyD88 and three other innate immune signalling networks are activated. 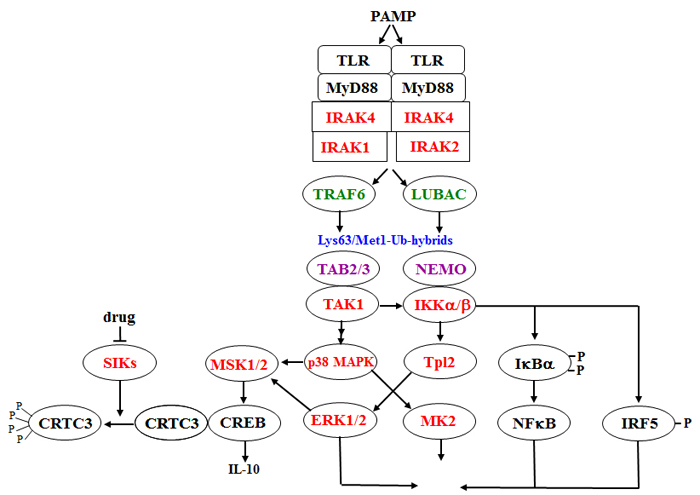 These hybrid ubiquitin chains have critical roles in controlling the recruitment and activation of TAK1 and the canonical IKK complexes [1, 2], which are the “master” kinases of innate immune signalling pathways. We discovered that the formation of Met1-linked ubiquitin chains and their binding to the NEMO component of the IKK complex are required for TAK1 to initiate the activation of IKKβ, in a process completed by IKKβ itself  (Fig 1). We have also found that IKKβ activates Interferon-Regulatory Factor 5 (IRF5) as well as NF-kB . Thus, IKKβ activates the two master transcription factors that control the production of pro-inflammatory cytokines, IRF5 and NF-κB (Fig 1). We noticed that the interaction of Lys63/Met1-ubiquitin hybrids with ABIN1 restrains the activation of the MyD88 signaling network and prevents the development of lupus nephritis, a severe autoimmune disease . The mice we generated in which ABIN1 is replaced by a mutant unable to bind to the Lys63/Met1-ubiquitin hybrids develop lupus nephritis spontaneously. However, excitingly, we have found that the disease can be completely prevented by crossing to mice in which the IRAK1 or IRAK4 protein kinases have been replaced by catalytically inactive mutants. These studies have validated IRAK1 and IRAK4 as potential targets for the development of drugs to treat lupus . This is important because, in recent years, human polymorphisms in ABIN1 have been shown to predispose to lupus and other autoimmune diseases in eight different human populations. We are also beginning to make progress in understanding the molecular mechanism by which ABIN1 protects against autoimmune disease. The MyD88 signaling network not only produces pro-inflammatory cytokines to fight infection, but also anti-inflammatory molecules, such as IL-10, which have important roles in terminating inflammation once it has done its job. We discovered that members of the SIK family of protein kinases (SIK1, SIK2 and SIk3) inactivate CRTC3, a co-activator of the transcription factor CREB that is a key driver of IL-10 gene transcription. We identified the first potent inhibitors of the SIKs and found that they transform macrophages from an inflammatory M1 phenotype to the anti-inflammatory M2b phenotype thought to be critical for the resolution of inflammation  (Fig 1). We have generated knock-in mice in which the three SIKs have been replaced by kinase-inactive mutants and crossed them with one another to produce double knock-in mice. We have used macrophages from these mice to provide genetic validation of our earlier results (Darling et al, submitted) and are now investigating whether macrophage driven inflammatory and autoimmune diseases are prevented in SIK knock-in mice to evaluate the therapeutic potential of drugs that inhibit the SIKs. Over the past year we have made several unexpected findings, which challenge widely held views about how the early signalling events of the MyD88 pathway are initiated. These findings have opened up several exciting new projects in my lab. Relevant recent lab publications cited – members of the Cohen lab are highlighted in boldface type.